Attention, all Disney fans! 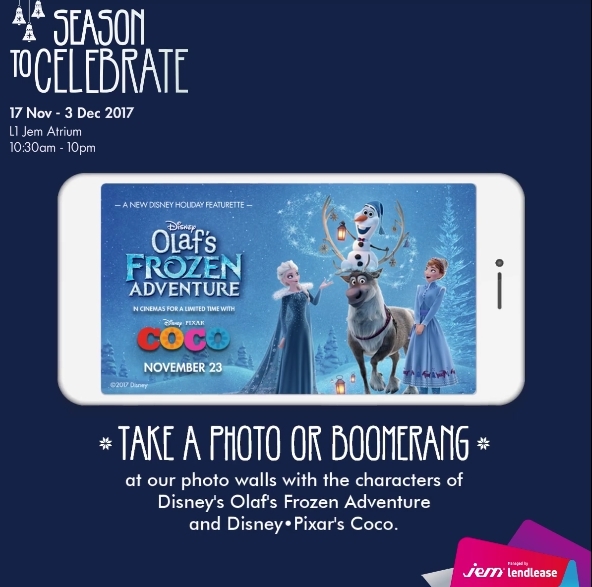 Stand a chance to win gift vouchers worth $100 when you experience the Disney event at Jem. 3. 10 of the most creative photo or Boomerang will walk away with $100 worth of gift vouchers from us! Contest runs from 17 November to 3 December 2017. Please visit www.jem.sg/disney for full terms and conditions. Disney’s Olaf’s Frozen Adventure – in cinemas for a limited time with Disney•Pixar’s Coco from 23 November 2017.